I worked up a good, frothy dudgeon and was thinking to myself, “What has happened to John since he left newspapers that he is taking such a troglodyte approach?” — and then I got to the end of his post. So, spoiler alert, he was not writing in inverted-pyramid-style. It was more like pyramid-style. The end held the answers to my questions. The “troglodyte” approach would be to require employees to subscribe and read (maybe quiz them, to test whether they really read), but, as John writes, a better idea is to ask your employees why: Why don’t they subscribe? Why don’t they read? If the only thing they read is the stories that carry their byline, then the only thing they care about is what was changed between writing and publishing, which means they don’t care about the content. If the reporters don’t care, why should anyone else? Ask them that. Ask what they SHOULD be writing about to make people read. Related to this, Peter Osnos had an article in The Atlantic resurrecting the idea that aggregators should pay for the news they aggregate, which ignores the fact that no one pays the aggregators, except advertisers, which are not at current ad rates a source of revenue that would sustain news organizations. Paying for aggregation is an idea that traditional journalists love, but if most news organizations started charging with a hard paywall, almost all aggregators would stop looking and aggregating — just as most people do not subscribe. Get to the basics: Whether or not your site has a paywall or a metered paywall, it’s important to ask what people will pay for and what will make them keep coming back. The same things that make your site worth aggregating are the things that make someone consider subscribing, so in the end whether you go the free model or the paywall model you hit the same capitalist question: Is it worth it? And you can’t change what people want to read. Among the gathering evidence: a Washington Post story. I had two thoughts as I read, belatedly, Megan Garber’s piece from last month for Nieman Journalism Lab about the new political team at Buzzfeed and how they approach reporting. First: Wow, that really sounds like exactly the right model for the online world. Second: How the hell are they going to make money from that? 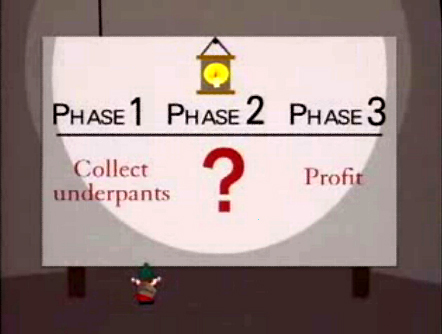 Which of course is the eternal Underpants Gnomes issue of online news. “The idea is to continue the type of work he’s been doing at Politico — reported blogging — and to combine that content with the social elements of Buzzfeed. So: Reporting, amplified. Reporting, viral-ized. … [The political team] will be starting from the premise … that people are now mostly (and increasingly) getting their news from social sources like Twitter, Facebook, and aggregators. Journalism is increasingly part of the social web. The result could be an organization with the nimbleness to operate in the online environment and build the kind of audience engagement that keeps people coming back, both to the short updates you get in social media and whatever more you produce on your main site, in the paper or on the air. That’s where the Gnomes come in. In other words, most people do not – and will never – pay for content, but some will pay for some specific content, and much more importantly that small number of people will pay to ensure that the general type of content you produce is around when they need it, because they enjoy it or they think it makes their world a better place, or they just can’t imagine their world without you around. That last part, at least, is something that traditional journalists can identify with.